Yard Barrier Spray or within a 60 mile radius. We use professionally applied spray that kills and repels mosquitoes and ticks. Our vector-trained technicians treat your common use areas such as pools, decks, patios, trees and shrubs. They also pay special attention to where mosquitoes and ticks breed and congregate. Our technique kills mosquitoes, masks your CO2 (which attracts mosquitoes), and repels them away from your property. The spray adheres to foliage, wood, stone/brick, and other organic materials. This creates a vertical barrier that strengthens with each visit. Protect your guests from mosquitoes and ticks for birthday parties, picnics, weddings, home BBQ’s graduations. Special event sprays help your guest enjoy your outdoor activity, not the bugs. A licensed technician will visit your property approximately every three-four weeks, depending on mosquito population and weather conditions. Treatment intervals can be as short as 14 days and as long as 30 days. Call us today for a free customized quote. We recommend treating 24-48 hours prior to the scheduled event to maximize the reduction of biting insects for your special day. Eliminating at least 85 to 90% of your otherwise biting guest. Keep your yard free of containers filled with water, such as gutters, birdbaths, tires, wheelbarrows, wading pools, and swimming pool covers. Clear away ivy and decaying leaves, because mosquitoes like cool, dark places. When walking through wooded or grassy areas in the summer, wear the same clothes that ward off mosquitoes. Light-colored clothes are best, because that makes it easier to spot ticks. We minimize mosquitoes and ticks by using select control products and a special misting machine. We offer synthetic and natural tick repellents. Knowing what, how much and when to use these products is an important process . We use as little of these products as necessary depending on weather and mosquito populations while balancing the need to protect your yard from the harmful diseases these pests carry. We spray the entire outdoor living space, and focus on areas where ticks tend to be more numerous, along the forested edges and in dense vegetation. We use a blend of all-natural oils that create a barrier in your yard. Through regular visits and applications, we can prevent mosquitoes and ticks from entering your yard. Why Should the State Be Concerned About Mosquito-borne Diseases? ​ The incidence of MBD is on the rise across the U.S. and there is evidence that MBD virus activity is increasing in Maine. These important trends and indicators lead public health officials and entomologists to be mosquito-borne virus risks in the near future. Detections of EEE virus—which were unheard of in Maine until recently—have been on the upswing over the last decade. Both WNV and EEE can cause encephalitis, which is sometimes fatal or can result in permanent neurologic impairment. Either outcome is very costly to the health care system. For optimal results in a tick and mosquito control program, Call the professionals for expertise and experience of a pest control treatment. We offer Pest Control Services to help in minimizing the Ticks and Mosquitos in your yard. 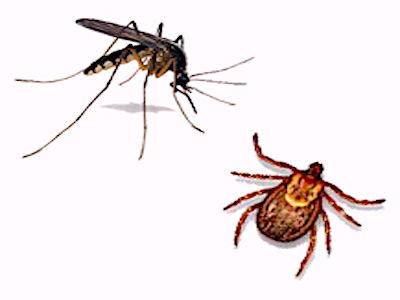 Fight the Bite:Take Precaution to Prevent Mosquito-Borne and Tick-Borne Diseases, Including Zika Virus, West Nile, Powassan and Lyme Desease. Certified Pest Management knows that NOTHING puts an end to your summer fun like finding ticks in your yard!! And while most people are aware of the dangers of ticks carrying Lyme disease, there’s also a growing number of Powassan virus cases in Maine!! And this virus, frequently found in ticks carried by deer and groundhog needs less time than lyme to spread!! What about other unwelcome guests burrowing into your home or yard, like skunks or raccoons? Certified Pest Management will remove them safely, with no harm to them or your home!! As a locally owned company with 17 years of experience of dealing with every type of critter and creature in the area, you can rest assured you’ll be taken care of every time!! So, if you have commercial or residential property, protect it from unwanted insects and animals by contacting Certified Pest Management for a free customized quote at 613-1914. Get back to enjoying summer with complete peace of mind!! Visit our Facebook page to learn more call Certified Pest Management @ 207-613-1914. 1. Choose light-colored clothing so it’s easier to spot ticks; wear long sleeves and tuck your pants into your socks. 2. Use an EPA-approved insect repellent. 3. Check your skin and clothing for ticks and remove them promptly. Don’t miss warm, moist areas such as the ears, armpits and neck, and have someone else check your back. 4. Wash possible tick bites with soap and water and apply an antiseptic. 5. Keep your lawn mowed and tidy to remove tick habitat. 6. If you spot an embedded tick, use a tick spoon or tweezers to grasp its mouth and pull it out with steady pressure. Don’t use petroleum jelly, hot matches or nail polish remover, which can increase the risk of infection.